At Hi Quality turf, we can help you get the best results for your next turfing job, but when is the best time to start? It could be tempting to throw down a few new rolls of turf on winter bare patches, but will it survive? 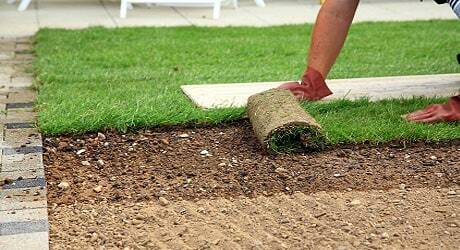 Read on for some helpful tips for the best time to lay new turf. Why does knowing the best time to lay turf matter? The time of year you lay your turf really dictates how long your grass will take to establish itself, how easily it can do this, potential damage from weather, and the amount of maintenance you need to do to help it out. Most regions of Australia will see cool winters where temperatures can drop into the single digits, and hot summers where scorching hot temperatures are normal. Cold temperatures can cause frosts and hot temperatures can cause burns, both of which will damage any newly laid turf. So a middle-of-the-road approach of not too hot, and no too cold is the best situation to lay turf. Depending on where you live, decides if you can lay turf in Winter. If you’re in the southern half of the country, or an area prone to near and below freezing temperatures, frosts and snow, then it wouldn’t be a smart idea laying turf in winter. These cold temperatures will physically damage your new grass, and establishment will take much longer as the grass is dormant. If you’re in the northern half of the country, where temperatures remain quite mild in winter, then you may be able to get away with laying a new lawn. Keep in mind though, your grass may still be dormant during the cooler months, so establishment may take longer than normal. Absolutely the best time to lay a new lawn. As the grass bounces out of its winter dormancy it kicks on with a flourish of growth. This means that establishment can be very quick, and with temperatures still being quite mild, it means there is less need for heavy maintenance, and less chance of damage from the elements. Getting in in spring means that come summer time, your lawn will be set and ready for the hotter days. But don’t mark the first day of spring in your calendar just yet! These early stages of spring can still be quite chilly, so play it by ear, and wait until the days are a bit longer and warmer. Much like Spring, this season will be when your grass is the most active growing. But as temperatures get into full swing, the stresses a new lawn can experience become greater. Hotter days will mean more maintenance by you after you lay, which means more watering as your turf sets roots, and a lot of mowing. If you’ve missed the boat on planting in Spring, the early or later stages of Summer are the best times, as you can still capitalise on the active growth, but manage to avoid the excessive temperatures. If you live in arid or hot regions of the country, I would advise strongly against laying grass in summer. The water demand will be far too high, and can be really complicated by any water restrictions that may come into effect. The opposite of Spring. As the temperatures begin to drop, the growth rate of your turf will drop as well. This means that laying turf in Autumn really can only happen in the first half of the season. If you lay towards to end, you’re running the risk of it not establishing before winter, and putting itself at a huge risk of failure. The cooler your region, the less time you have to lay any turf in Autumn so if you can, put it off until Spring. Still unsure about when the best time to lay turf is for you? Hi Quality turf are here to help! Give us a call to discuss all aspects of your next turfing job.